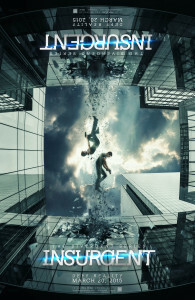 Director Robert Schwentke brings us the sequel to the Divergent series with Insurgent. Now as we remember we left off from Divergent with Tris (Shailene Woodley), Four (Theo James) and her brother Caleb (Elgort) trying to escape Jeanine (Kate Winslet), and her overly obsession to take over the entire faction society and destroy the Divergents. So there is no surprise that the film only begins from where it left off. Tris, Four, Caleb and Teller are on the run, as Jeanine “clang” find a box that according to Jeanine “will have the answer to successfully rule all of the faction society.” Only to find out that the “mystery box” could only be open by a divergent. 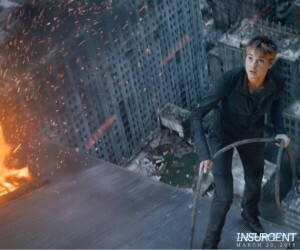 However, much of the drama of “Insurgent” takes place in a virtual reality in which Tris faces challenges that force her to restore herself in mourning the death of both her parents and friend Will. Trying to find herself at ease with these lost, Tris sees no other solution but to kill Jeanine. There’s no lie that Jeanine has done everything in her power to prove that Divergents are evil and are what is wrong with their socity, Tris and Four have no other choice but to keep running and searching for the rest of the Dauntless crew. Although this is not easy for them especially after being betrayed by both Caleb, and Teller they still manage to make alliances with the people they come across. Insurgent is most definately different from Divergent you no longer see Tris hesitant, but rather more angry and ready to make someone pay for all the suffering and pain that has been done to her and the hundreds of people killed. But is that enough to stand up against Jeanine and bring a stop to all of these Factions? Insurgent is definitely a must see film, and don’t let this action thriller and Tris’ eagerness to get even foul you, as there are a few sensitive scenes. This film is definately a must see! Afterall, don’t you want to find out if Divergents really are the problem?…or are they simply the solution?